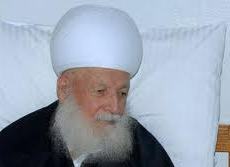 The highest Druze spiritual authority Sheikh Abu Mohammad Jawad Walieddine passed away Friday morning at his home in Baaqline, Chouf region of Mt Lebanon at the age of 96. Sheikh Abu Mohammad Jawad, who was the most respected spiritual leader in the Druze community headed the Druze Spiritual Council. He died of natural causes according to sources close to him. Sheikh Abu Mohammad Jawad was born in Baaqline in 1916. He was the symbol of peace for his community during the Lebanese civil war and was known as the “Lion of the Chouf” for his courage … He reportedly was living in his house without any guards during the civil war and his door was open for all visitors all the time. Amen. A rarity in Lebanon. Hannibal, My grand mother lived 108. She was born ,and got married during the rein of Sultan Abdul Hamid II.lol.If we can make it half their ages, we’ll be lucky. may god rest his soul in peace. He was a symbol of greatness. I wish i and every one could work on our selves the way he worked on his. we would be in a better world. Maybe thats why god creates such greatness, for us to learn, believe and understand that life is not eternal but our actions are. I wish and pray my deepest condolences for all the druze in lebanon.